Order Up – Food Halls! The decision-making process for corporate real estate outsourcing has become increasingly dynamic. The drivers that frequently tipped the scale in favour of the largest global service providers with their expensive proprietary technology are no longer as compelling given the rise in importance of behaviour-based qualities of service providers, including trust. Smart industry leaders should keep an open mind to both large and medium-sized service providers when evaluating outsourcing candidates. Outsourcing drivers are changing among heads of corporate real estate for occupants, especially those with smaller or medium-sized portfolios. Their companies often do not need fully integrated, global services. These leaders now have more choices and are more open to working with smaller- and medium-sized firms that do not necessarily position themselves as full-service global corporate real estate providers. It all begins with trust. Trust in an outsourcing relationship is more important than what both parties negotiate into the service agreement. Trust is a key element to the long-term success of the relationship. Trust is causal – that is, a direct link exists between trust and longevity in outsourcing relationships. Some industry watchers are even now wondering whether larger service providers have lost the ability to move quickly, think entrepreneurially or take reasonable risks. The conventional wisdom is that a broker-led model, which supposedly casts aside the breadth of non-brokerage ancillary services, is somehow lacking when compared with a corporate services-led brokerage approach. More recently, some corporate real estate leaders have reversed course from a traditional corporate-services model to a broker-led one. The new broker-led service providers are not burdened by the overhead of typical large full-service brokerage firms. For years, the default corporate option was to favour the largest global service providers, most of which rely heavily on expensive proprietary technology as a way to smooth over any gaps in integrated service delivery. Increasingly, corporate real estate executives are realizing that the behaviour-based qualities of service providers like commitment, team chemistry and trust are just as important – or even more important – than sheer scale or technology to the overall success of the joint relationship. As a result, pragmatic corporate real estate leaders include both traditional large and medium-sized service-provider firms when contemplating outsourcing candidates. The results achieved for satisfied clients by many of these nimble mid-sized firms are simply too compelling to ignore. It all started with a website. A website that really needed upgrading. When Birmingham’s Brindleyplace was sold in 2017 and Hines (the former owner) was retained as asset manager, the time was finally right to address the website, much to the delight of Avison Young’s destination-marketing team, who are retained by Hines for leisure marketing on the estate. This situation, however, opened up a much wider conversation: What about the brand? What do the occupiers think? What else is going on in Birmingham, and where does Brindleyplace need to be? For a marketing team, this was an opportunity like no other – to be part of rebranding a major landmark. Something of a celebrity in the world of mixed-use, Brindleyplace is the textbook example of city-centre regeneration that is used as a case study for thousands of students the world over. The assignment wasn’t just about a single building or the office market. This estate is a key part of Birmingham’s ongoing regeneration story, but now it faced new challenges. With an ever increasing amount of new developments on its doorstep. It needed to retain its stature and appeal. As asset manager, Hines took the brave decision to really get under the skin of the issues, and through Avison Young engaged Real Service to undertake research with existing occupiers, prospective clients and neighbours. The results told an interesting story. A story of an estate held in affection by many, appreciated for its high standards and safe atmosphere. On the other hand, criticisms were levied, such as the estate being …wait for it … too clean! Whilst these criticisms were explored much deeper than we can cover here, in summary it was recognised that Brindleyplace needed to become more accessible, but with an edge, an edge that would continue to cement its position as Birmingham’s premier mixed-use estate. The results of Real Service opened up a set of work streams which Hines has pursued with a real commitment and passion in partnership with Avison Young to ensure the research findings are addressed. One of the work streams was branding. There was recognition that the brand needed improvement – both visually and in terms of acting as a guide for the whole ethos of the estate moving forward. Several workshops were held, facilitated by creative agency Core to discuss the research findings and where key stakeholders felt Brindleyplace needed to be. Much debate was had around the name. Brindleyplace is often referred to locally as Brindley, and it was a strong contender for a name change. In the end, the decision was to continue as Brindleyplace officially, but at a campaign level to be able to use Brindley with a new strapline: “The Place.” Thus, the new creative features a play on the words “The place.” For example: “Brindley The place for business/events/meeting friends/eating out/etc.,” certainly provides a flexible, yet strong approach for all communication. The accompanying creative is bold, fresh and a significant move forward. Alongside this, a set of values was identified. We know Brindleyplace is unique. There is nowhere else like it in Birmingham (or, indeed, many other places!) in terms of the daily demographic, the managed estate environment and the range of special events for occupiers. We now need to focus on keeping it just so … Where else can you get a National Sea Life Centre next to a big-four accountants office? Where else do you get a range of pop-up events throughout the year that are refreshed continually by a dedicated on-site team? Where else offers one of the safest places in Birmingham alongside some of the city’s best nightlife? Finally, the value that will continue to be worked on the most is community. From an estate that was an original pioneer of work-life balance back in the ’90s, much has been done to provide facilities and events for occupiers – but not necessarily to bring together a joined-up community. This last aspect is being addressed through a range of communication improvements, including a partnership with Workwell to introduce a new tenant portal, Hines’ first one globally. This portal will include the opportunity for occupiers to create their own groups and to network online as well as in person. The community aspect will continue as a work stream for the long term and a range of wider initiatives and partnerships across the city, including work streams to address graduate retention and wellness on the estate, are being worked on by Avison Young’s destination-marketing team. The new creative is unveiled today with the new website finally going live amongst a number of other initiatives. Creative will also be unveiled across the estate, and more than 300 pieces of signage have been replaced, but this project is about so much more than a logo. Every touchpoint has been looked at. All staff have been briefed; from the senior directors to the electricians and everyone in between. The events programme has been completely reviewed and refreshed in order to keep the element of surprise. Whilst a huge amount of work has gone on in the last 18 months to get to this point, this isn’t the end – it’s just the beginning of Brindleyplace’s new chapter. This work combined with the £7 million in investments being made into refurbishing three buildings, a new partnership with a leading university to be announced shortly and a major new event in September mean Brindley is the place that never stands still. To discuss Brindleyplace further, contact Lydia Ellis by e-mail lydia.ellis@avisonyoung.com or by phone 07770934185. Not too long ago, the dominating trend in commercial real estate was co-working space, which was addressed in our September2018 blog. Lately, it seems to be raining food halls – the trendy, chef-driven, micro-restaurants that are quickly becoming the ultimate amenity. 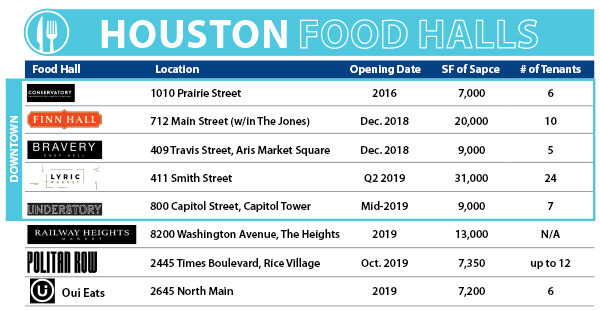 Since 2016, Houston has seen eight food halls either open or announce their upcoming opening. Most of them are located downtown, with others popping up in The Heights and Rice Village. Is the collaboration of landlord and restaurateur just another flavor of the month, or will this become a signature dish of the commercial real estate landscape? metro area received 11 semifinalist nominations for the prestigious 2019 James Beard Chef and Restaurant Awards. So, it is no surprise to see the food hall craze take Houston by storm. Just as we saw the food truck rage give aspiring chefs the opportunity to sell their innovative dishes without the burdensome overhead costs, we are now seeing some of the once mobile, artisan food vendors put it into “park” inside commercial and residential buildings and set up shop in food halls. With almost guaranteed foot traffic and short-term leases, it’s no surprise that the concept appeals to chefs and restaurateurs. (really good food) to your office building or residential building and they will come. “They” being both tenants and consumers. The question is, will they come often enough to sustain a profitable business? Of course, that’s always the challenge for any business, but especially the restaurant business, where smaller startups with less than 20 employees have a higher failure rate than any other service business as reported by Forbes.com. Trends will always have winners and losers, and those who survive the food hall craze will be those who appeal to more than just your taste buds. They will have attractions that create an experience for the consumer and will be located in areas of large working and residential populations. 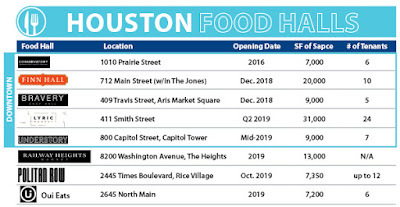 Landlords, chefs and restaurateurs will eventually find the right balance for their locations, and the market will ultimately stick a fork in it and decide who is done and who will continue to serve it up to Houston. On behalf of the board of directors of Avison Young, our employees, our clients and our partners, we are humbled to once again achieve Platinum status with the Canada’s Best Managed Companies program by retaining our Best Managed designation for eight consecutive years. Sponsored by Deloitte Private, CIBC, Canadian Business, Smith School of Business and TMX Group, the Best Managed program recognizes the best-in-class of Canadian-owned and managed companies with revenues greater than $15 million demonstrating strategy, capability and commitment to achieve sustainable growth. As a company that was founded in Canada and now operates in 20 countries, we couldn’t be more proud to receive this award, and we thank Deloitte and the other award administrators for recognizing Avison Young among a distinguished group of Platinum members. This recognition not only highlights our company's success in our Principal-led growth strategy and management approach, but also the expertise and commitment of our employees, our collaborative culture, and our continued focus on pursuing innovation and investing in meeting the needs of our clients. Now in its 26th year, Canada’s Best Managed Companies is one of the country’s leading business awards programs, recognizing Canadian-owned and managed companies for innovative, world-class business practices. Every year, hundreds of entrepreneurial companies compete for this designation in a rigorous and independent process that evaluates the calibre of their management abilities and practices. Deloitte also officially announced the winners last week in Canadian Business www.canadianbusiness.com/bestmanaged and a feature story in MacLean’s magazine will hit newsstands later this week. You can learn more here on Deloitte’s website: www.bestmanagedcompanies.ca and on its social media pages http://twitter.com/deloittecanada; www.linkedin.com/company/deloitte-canada, as well as on Avison Young’s social media channels (hashtag is #BestManaged). We celebrate this award with our clients, partners and employees who help us grow globally every day. 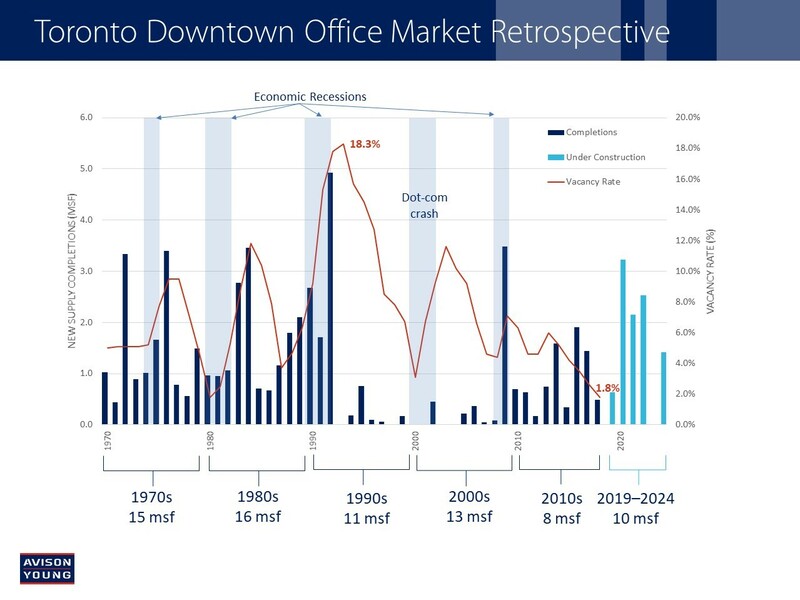 As I celebrate 10 years with Avison Young, I can’t help but reflect on the changes I’ve seen in the downtown Toronto office leasing market during my 31 years in commercial real estate. Those who have joined the industry in the last 10 years – when we’ve seen continuous development in the downtown market – may not fully appreciate the extent of the peaks and valleys the market has endured over the decades, and how the current wave of development compares to the boom years of the 1970s, ‘80s and early ‘90s which shaped the downtown as we know it today. These musings inspired me to create this chart, putting the past 50 years into perspective – along with what’s coming in the next five years. 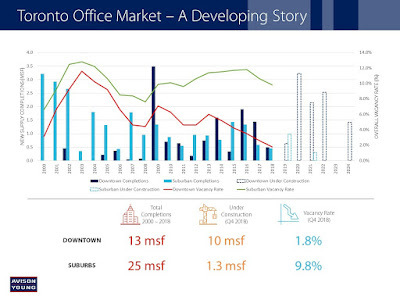 A look back over the years inevitably leads to the question: does this ongoing construction cycle, which started in 2009, constitute a renaissance in the Toronto’s downtown office market? With historic-low vacancy (1.8%) and a burgeoning development pipeline, the red-hot downtown market has attracted a lot of attention recently – and deservedly so. Supply constraints remained the market’s Achilles heel in 2018 and will be the primary brake on growth in 2019. This situation is set to persist until nearly 8 msf (out of a record wave of new development comprising almost 10 msf) is delivered to the market between 2020 and 2022. Consequently, rents are on the rise and although each deal is different, in many cases, space that would have leased for $35 per square foot (psf) net one year ago has risen to the range of $40 to $50 psf, with rates breaching the $50-psf mark for the best office space. Although the building boom downtown continues to capture the headlines, a comparison with the city’s suburban markets paints a different picture. The results may surprise you! 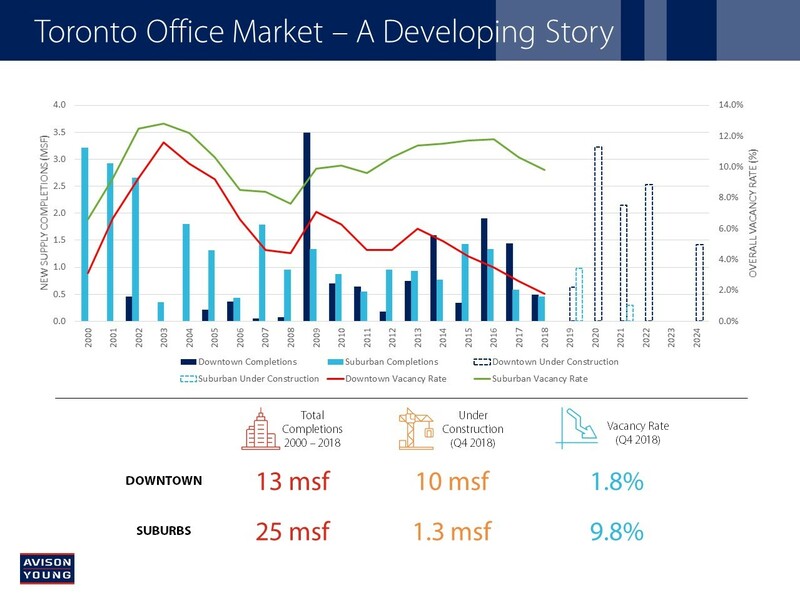 Since 2000, cumulative new office completions in the suburbs outpaced downtown by a factor of nearly two to one. This gap is set to narrow, as almost 10 million square feet will be delivered downtown by 2024 – compared to just 1.3 million square feet now underway in the suburbs. As of year-end 2018, suburban vacancy fell below 10% for the first time since 2011 (buoyed by a strong performance from Toronto West), as the suburbs posted notable quarterly and annual gains in occupancy, which lifted overall suburban absorption to 1.7 msf – an 11-year high. Even though the downtown office market receives most of the attention, the suburbs appear to be turning the corner, supported by a greater emphasis on public transit infrastructure, transit-oriented development and urbanizing assets. For example, the Vaughan Metropolitan Centre has benefited from the TTC subway connection opened in 2017, while the GTAA’s Pearson Transit Hub project looks to bring connectivity to the surrounding Airport office nodes. Though downtown is booming, could dwindling available sites and the rise of transit-oriented development favour the suburbs and actually help to sustain the longer-term development trend? Only time will tell. For the past 15 years, I have been advising owners, banks and insolvency trustees on the sale of land and other real estate throughout Germany. Often, the properties are no longer in demand and, therefore, new usage ideas have to be developed and implemented. Consequently, changes in use have to be approved by local authorities. The process of seeking the approval of a new use for a former industrial site is particularly challenging and demanding. Often, sites are contaminated and disproportionately high disposal costs are added to the sale price, making the site’s sale and conversion even more difficult. The future allowable use is usually unclear, and that raises the question for investors of whether the purchase and demolition are economically viable. The above factors make the broker’s work significantly more difficult and force the seller and the buyer to spend a considerable amount of time reviewing a potential transaction that faces an uncertain outcome and risk of cancellation. The solution to completing this type of difficult deal lies in getting a real estate broker and the local authorities involved early in the negotiation process. Without clear confirmation from the authorities on what is allowed and what is not, the seller and the buyer will have difficulty converting the site to a new use. By dealing with authorities on a daily basis, the broker has knowledge and expertise that the seller and buyer often lack. Early advice and contact with the authories will make the everything proceed much more smoothly. For example: Avison Young is currently representing a U.S.-based chemical company in the sale of a 700,000-square-foot site in Pirmasens, Germany. Chemical production at this location is no longer economically viable. Preliminary talks with local authorities revealed an attractive – and allowable – use of the property as a 24/7 logistics operation. The use of retail was categorically rejected. The authorities’ clear statements on the property’s allowable and unallowable uses enabled us to approach logistics real estate developers in a targeted manner and to enthuse about the location. The property’s sale is scheduled to close in May 2019. We couldn’t have been more excited to announce last Friday the completion of our acquisition of GVA – one of the U.K.'s leading and most diverse real estate advisory-led businesses.Even more exciting is that our two companies have now combined under one unified brand – Avison Young. This acquisition represents another milestone in our global expansion strategy, and the combination better positions us to serve our clients across the world. As a result of the transaction, we are now 5,000 strong in 120 offices in 20 countries around the world, and the only privately held, Principal-owned, global, full-service commercial real estate services firm. The combination also establishes Avison Young among the top five commercial real estate advisory businesses in the U.K. In GVA, we’ve added a like-minded U.K. real estate leader – a company that brings a partnership culture formed during more than 200 years in business. By combining our two complementary businesses, we increase our scale and presence, expand our global talent pool and reach, and enhance the breadth and balance of our services. Most importantly, the combination increases the resources that we can invest in innovation to keep our clients ahead of the curve. In the U.K. alone, Avison Young now has 18 offices and 1,600 employees, working with clients on the transaction and consultancy sides of the business. GVA brings to Avison Young a broad portfolio of national and international clients, including U.K. public institutions, multinational corporations, major space users, developers, owners, lenders and investors. Furthermore, the scale and depth of GVA’s offering is evidenced by the firm’s services organized around a client’s lifecycle of real estate: planning and development; project management and building consultancy; transactions; property management services; valuation and business rates. This is a very exciting and memorable time in the history of Avison Young, and we look forward to working with our new clients, colleagues and partners around the world. Mark E. Rose is Chair and CEO of Avison Young.